The only one-armed man to play major league baseball. Born and resided in Nanticoke’s Hanover section. As a child, he lost his right arm in an accident. Named Most Valuable Player of the Southern Assn. while playing for the Memphis Chicks in 1944. In 1945, he played 77 games as an outfielder for the St. Louis Browns and batted .218. His on-field exploits set an inspirational example for disabled servicemen returning from World War II. Erected 2003 by Pennsylvania Historical and Museum Commission. Location. 41° 11.112′ N, 75° 58.989′ W. Marker is near Nanticoke, Pennsylvania, in Luzerne County. Marker is at the intersection of Front Street (Pennsylvania Route 2010) and Center Street, on the right when traveling north on Front Street. Touch for map. 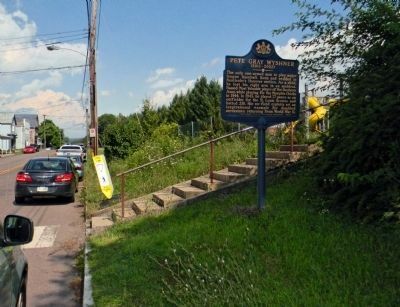 Marker is in this post office area: Nanticoke PA 18634, United States of America. Touch for directions. Coal Miners Memorial Monument (approx. 1½ miles away); War Memorial (approx. 1.6 miles away); Veterans Memorial (approx. 1.6 miles away); a different marker also named War Memorial (approx. 1.8 miles away); World War II Memorial (approx. 2.2 miles away). Touch for a list and map of all markers in Nanticoke. More. 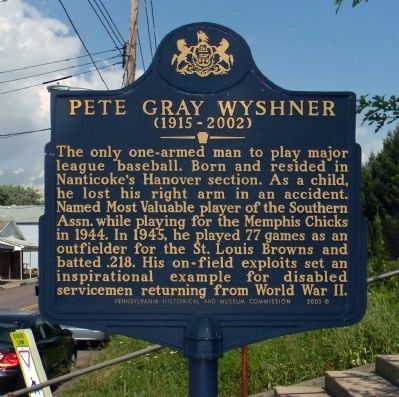 Search the internet for Pete Gray Wyshner. Credits. This page was last revised on June 16, 2016. This page originally submitted on September 17, 2013, by PaulwC3 of Northern, Virginia. This page has been viewed 347 times since then and 8 times this year. Photos: 1, 2. submitted on September 17, 2013, by PaulwC3 of Northern, Virginia.